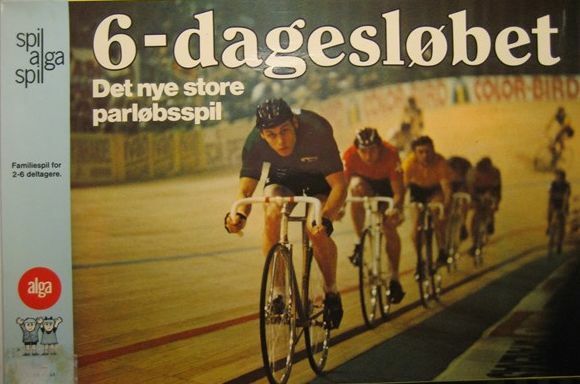 C.Drechsler / Drechsler Spil / Sesam Spil / Alga Spil, Danmark, 1960s/1970s? 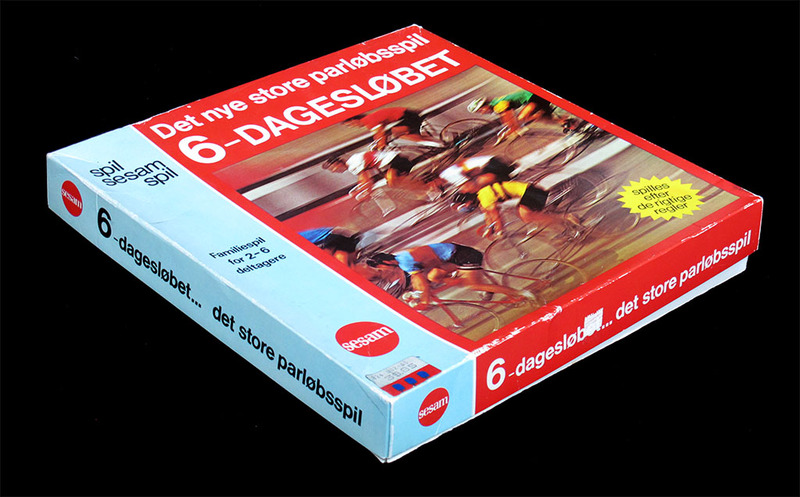 Danish game of which there are several editions. 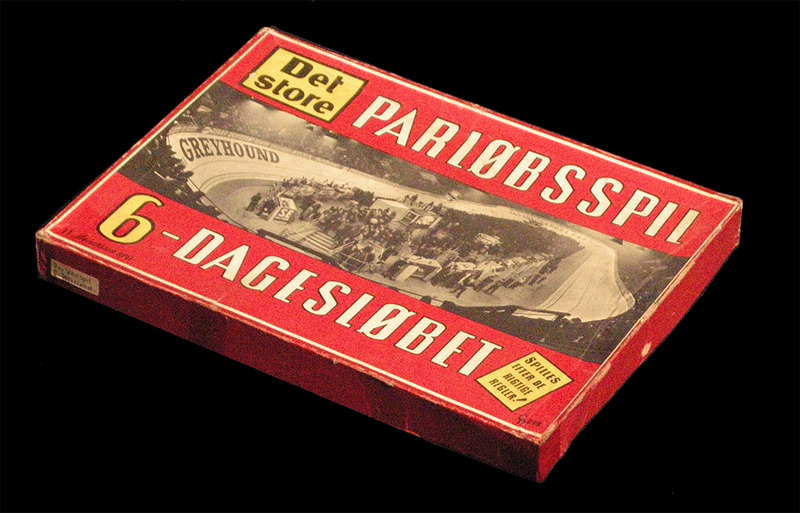 The first edition was released by Drechsler Spil, and the rules are signed by one C. Drechsler, so it is safe to assume it was a self-released game. It is difficult to date this game since the box and the rulebook hav a retro look that would make one think the game is from the fifties. 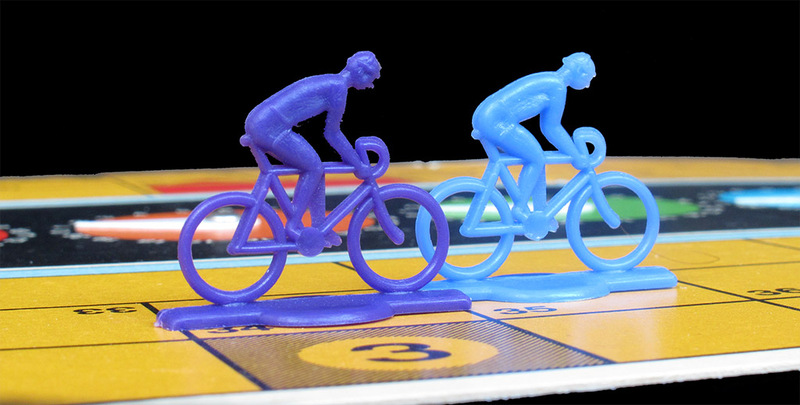 However, the board and the riders look more modern. There are two later editions, one by Sesam Spiel and another by Alga Spiel. The one featured here, by Sesam Spiel, does not have a date either but, from the look and feel, I would say it is from the late seventies or from the early eigties. The riders, however, are almost identical in the two editions. The topmost board is the one by Drechsler Spil (light cardboard, rectangular). 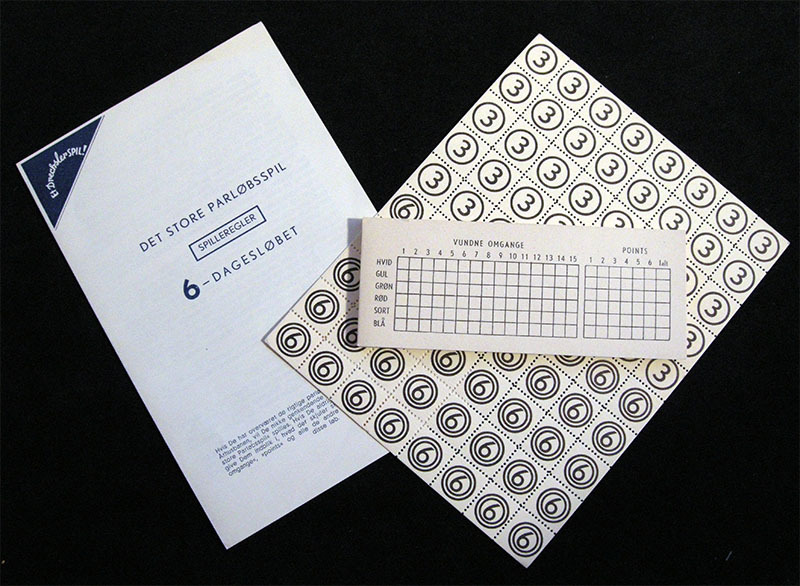 The other is by Sesam Spil (sturdier cardboard, oval, with lap counters). As far as I know, the Alga Spil board is similar to the one by Sesam Spil. By the way, the difference in colour between the boards is just that I took the pictures on different days with different light. Sorry about that. 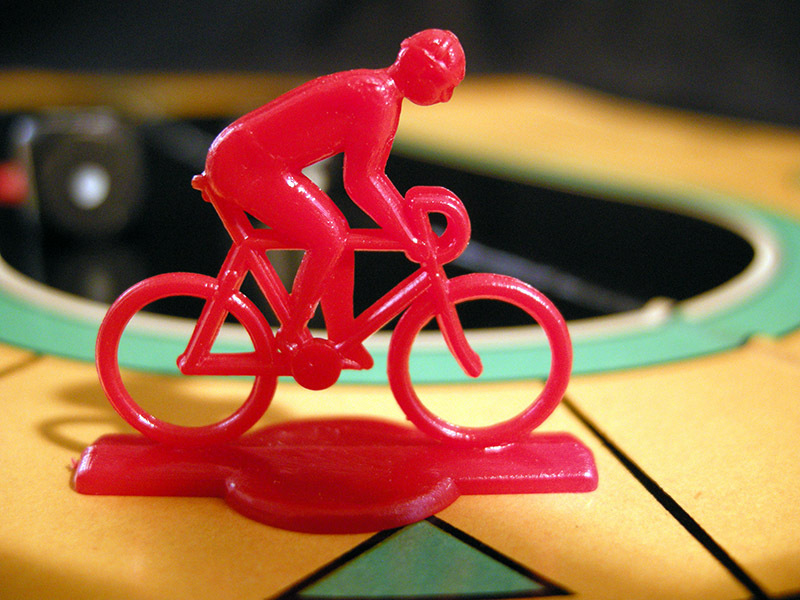 The game represents a 6-day race. The rules are only in Danissh, but with the help of automartic translators and some patiente, I have been able to read them. If someone needs a broken English uncorrected translation, let me know. 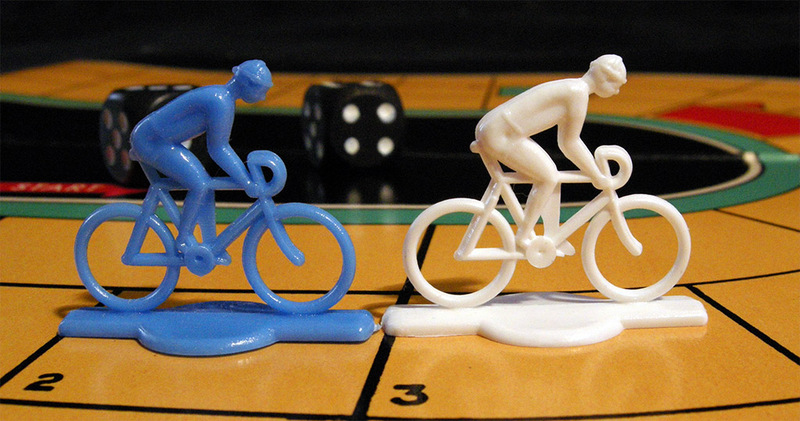 The players manage teams of two riders, one of which represents the resting rider and mnoves in the outer lane, while the other represents the racing rides and moven in the middle and inner lanes. 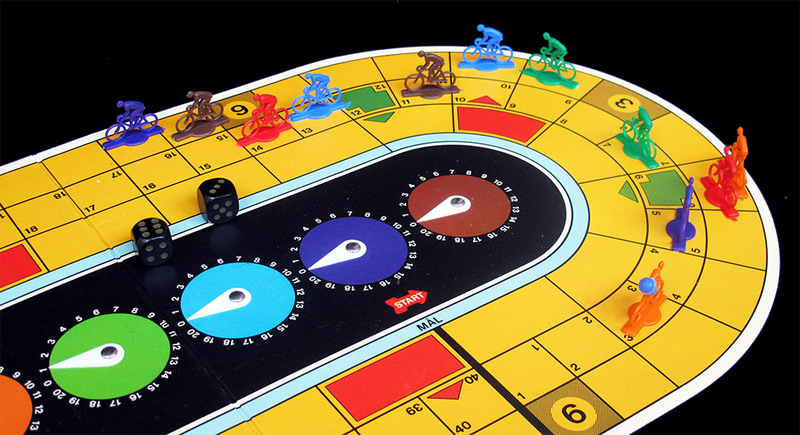 The player throws two dice and uses the lower value to move the resting rider and the total value of both dice to move the racing rider. Thus the racing rider is much faster. When the racing rider catches up with the resting rider they are suppposed to relay. For the sake of clarity they do not exchange roles, but the player gets an extra throw. The racing rider moves generally on the middle lane, but he can descend into the much faster inner lane and try to win a lap. He succeeds if he catches up with the last racing rider (which is marked with a little plastic implement). 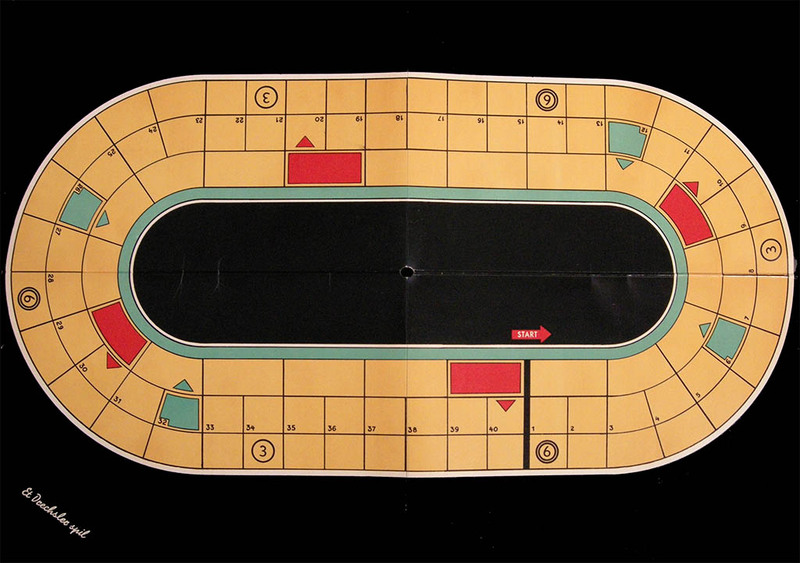 When a rider wins a lap, he scores it on the provided notebook or on the counters on the board (depending on the version of the game) and moves back to the middle track. - Paying 18 sprint coupons (white pieces of cardboard / paper marked with "3" or "6"). These coupons are received every time the resting rider falls on the fields marked with "3" or "6" on the outer track. Every once in a while there is a Sprint. All the racing riders are placed on the starting line and they race for a track lap. 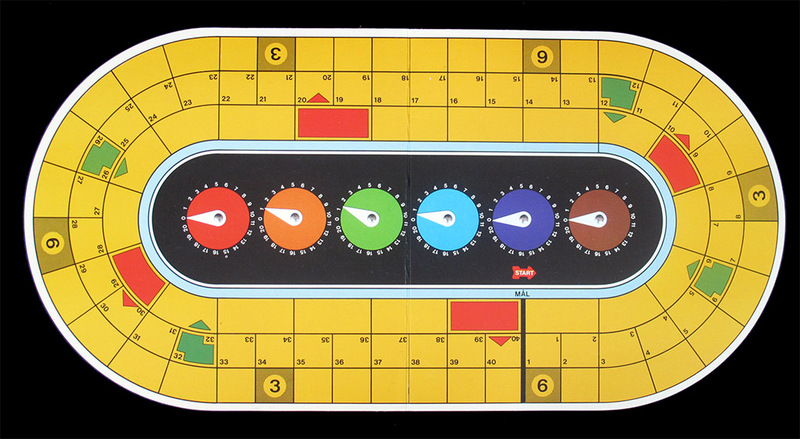 Apart from the dice throws they may use sprint points during the Sprint, but not more than six in a turn. The resting riders do not move during the Sprint. The winner of the game is the team with most laps won, and in case of a tie, the one who has won most points in the Sprints (5 to the winner, then 3, 2, 1. Not to be confused with the sprint bonuses). 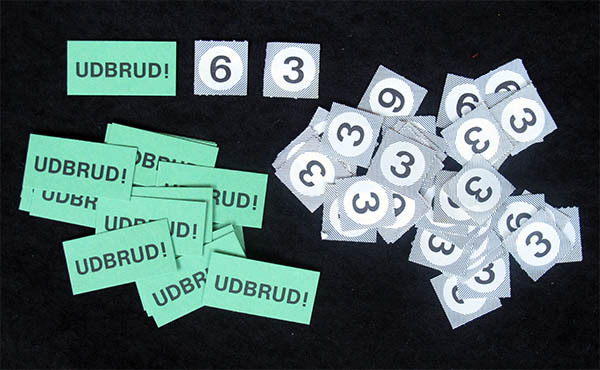 The rules say that a sprint should be played "every half hour", and that at the beginning of the game each player receives one green "Udbrud!" card for every half hour that the game is going to be played. Considering that there are 40 such cards and not more than 6 teams, this means that the game will be played during 3 or 4 hours. That is not six days, but it is quite long anyway! Notice the little implement marking the last racing rider. (The red rider is thus about to win a lap). The bonuses in the Sesam edition (top) are made of plain paper, while the ones of the original edition (bottom) are of light carboard.